Heavy weight training and TT coexist? With regards to the conversation above about strength vs size, I think the devil is in the details. High reps (15ish or more) will mostly lead to muscle endurance. All those metabolism enzymes get "better." With 8-12 reps-ish, you're going to be getting stronger, but also putting on a fair amount of muscle. With low reps (2-5ish) you're going to get power (which some people call strength) but won't put on a lot of size. I figure table tennis players would benefit mostly from the low-rep power training and the high-rep muscle endurance training, but not so much from the 8-12 rep training that gets you bigger. Most are very weak and would benefit from any of the above due to novice gains but j agree with the rest. Apart from the power/strength comment. You have the nomenclature wrong there. It's strength but power is improved concurrently as strength is a component of power. If you train quick lifts this is slightly different as they express power. And to add a little bit more, as more and more research has come out in the past 3 years or so, it seems that on a set by set basis, reps anywhere from 6 all the way up to around 30 provide an equal stimulus for muscle growth (provided you come appropriately close to failure). So if you're training hard and doing sets of 15-30 reps, you'll still build muscle (in addition to increasing muscular endurance). You'll even be able to build muscle with sets sub 5 reps, it's just not as efficient (you'll have to do more sets and rest longer). All that being said, even under the *best* conditions, muscle growth is a slow process that is easy to control, maintain, and even reduce if you feel like you've taken things too far. Worrying about gaining too much muscle and becoming bulky is like worrying that if you read a medical textbook you might accidentally become a doctor. 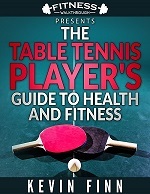 Grab a free copy of The Table Tennis Player's Guide to Health and Fitness. One of the first videos I watched when I first started playing TT was the 1987 WTTC. I remember thinking "I guess to be a world class TT player, you need to be anorexic." Search the players that year: Jiang Jialiang, Waldner, Lindh, Persson, Ulf Carlsson, Teng Yi, the Mazunov brothers, Zoran and Lupi, Rosskopf, Grubba, KTS, Yoo Nam Kyu, etc. But I did remember that Gatien had a not so skinny body, but still explosive. But the rest all looked like you could wrap your hands around their waist. This "anorexic trend" would continue into the late 1990's. KLH vs. LGL in the 1995 WTTC finals come to mind. Fast forward to 2003 with the introduction of the 40mm cell and things appeared to change. Schlager of course won and if you compare his physique from let's say 1997 WTTC to when he won in 2003, he was still skinny but had a but more on the upper body. Kreanga was not always very skinny. And as we moved to 2005 until 2013 before the 40mm plastic, players were definitely not skinny. Take for example Wang Hao. You can also compare the 1997 versions of WLQ and Ma Lin to their 2007 versions. Definitely much more muscular. So we can tell they are now lifting weights. As for Heavyspin's question, go for it brother! In this video, I've been under the impression that doing single stack cable rows are for conditioning and moderate power gains, while double stacking is for power. Is that correct? We need to build a ball to keep the illegal servers from entering our tournaments. There is only a subtle difference apart from the weight lifted. They are both "for" exactly the same thing just depends on intensity/volume. The real gain in weight comes from double stacking those all you can eat pancakes at IHOP. Good point - can't argue with that. A slightly of topic post maybe but hopefully of some interest. "Bragden" a swedish documentary focusing mainly on the national teams gold medal in 1989 world championship in Düsseldorf (it is actually 30 years ago today 4th of april) describes how the swedish training regiment changed during the 80s. During world championship 1987 in New Delhi most of the team got sick. Appelgren was to sick to compete in the singels tournament but Waldner did and managed to get to the finals where he lost to Jiang Jialiang. The analysis after the tournament came to the conclusion that Waldner had been playing the best table tennis of his life, in no small part due to the fact that he had lost 9 kg during his illness and therefore where faster and could use his forehand more. After worlds 87 the national team started more focused weight training to be able to be faster and more explosive. They couldn't plan stomach flue before every tournament after all . Off course the documentary does not describe the training program but there is an interview from 87 or 88 where waldner is seen squating 50 kg and stating that the plan is to be able to squat the double within 6 months which isn't very impressive but at least tells us that they did weight training with the aim of getting (much) stronger. For those interested - the documentary is avaliable on youtube with english subs. Highest rating 2124, obviously he spend a ton of hours at the gym! I never saw that one, thanks. This is my favorite Ron Joseph video from a while ago. Glad I only ever practiced with him! Hate to have my opponent take off his shirt and flex on me, if I did that someone would call the SPCA and claim there was a bear loose in the TT gym! Do Ron and Renata ever play in your area? She was a SOLID player! Yes, I'm friends with Ron and have seen Renata compete at several tournaments. Heavy weights are needed in tt provided you have an annual calendar of training divided into phases. Pre competition phase is the one with the highest amount of weight and lesser amount of reps but it is also the phase where it starts going down (weights) up until the competition phase wherein your weight used is only the weight of the racket. USATT lists him at 1407 in 1994 and he's currently 2067. That progress is nothing to sneeze at! Regardless of his muscles or athleticism, you need to have good TT IQ at that rating range. It's great that he's maintained his flexibility and range of motion with that bulk. I also read in Gatien's book that weight training is important.